This is a summary for Brinley from 33-33.5 months old. Big news here! Brinley moved to her twin bed and out of the crib. Brinley started to be more open to the idea of a big girl bed when I would tell her she would soon more over. She thought that sounded like fun most of the time. We set up her bed one Saturday night. Sometimes we don’t do things in the ideal way now that we have four kids. Ideally, we would have done this on a Friday night so we could have a couple of weekend nights to work things out. We also would have not done it on the same night we had Brayden’s birthday party with friends (yep, that is the night we did it). But we always go with what timing just seems right and it seemed like the right day. We also have to work around the family schedule, and taking down a crib and setting up a twin bed take time. We have more time to do those things on a Saturday. Despite things not being ideal, Brinley handled it perfectly. She was excited. 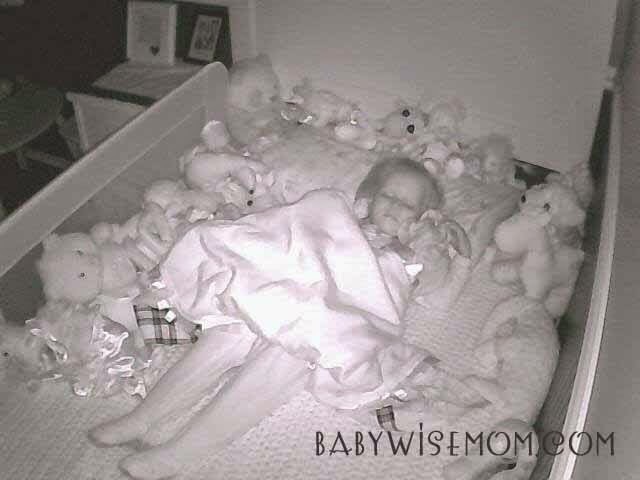 She set her stuffed animals and dolls all up in her bed the way she wanted them. She stayed in her bed! She slept great. She stayed in her bed until we got her up in the morning. The bed transition has gone very well. During one nap, she hopped out of bed to get some books off of her night stand to look at. I spoke into her monitor and told her she needed to stay in her bed. She paused for a moment, thinking, and then responded, “I am.” She didn’t say it in a sassy way–she sounded a bit confused. She obviously considered herself getting a book and getting right back into bed to not be getting out of bed. I decided that I don’t mind her having access to some books to look at in bed at her age. Before nap and bed time, we pick three books to set on her night stand that are okay for her to look at in bed (I am always careful to make sure the books are very toddler proof since one time Kaitlyn destroyed some books in bed). She stays in bed since her books are right there for looking at. I am very happy with the transition! Playtime is continuing on as usual. She had a few days where she got out of her room a few times each independent playtime. It is always to get help with dressing some doll. I always start my response to that with reminding the child to stay in the room and being patient. I totally get wanting help with difficult things, but I also want her to work at solving her own problems and I think that for a short time each day, she can play with things as they are if she can’t take care of it on her own. We had some good times this time period with boundary testing. Getting out of Independent Playtime is just one example. She did fun things like intentionally spill her Cheerios all over the floor during Brayden’s evening of excellence for his gifted and talented program. Good times. It makes her being good for her bed change even more amazing.